In the photos on this page I haven't shown the year-side of the cards, I don't want to be spoiling the fun for you. 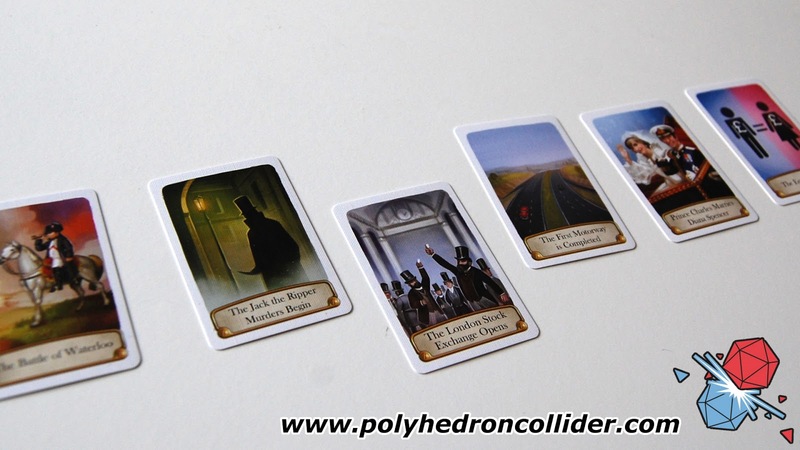 As you play you will build up a line of events, a Timeline if you will, and the game becomes progressively more complicated as it plays. With more events on the table the positioning becomes more 'granular' for want of a better word. 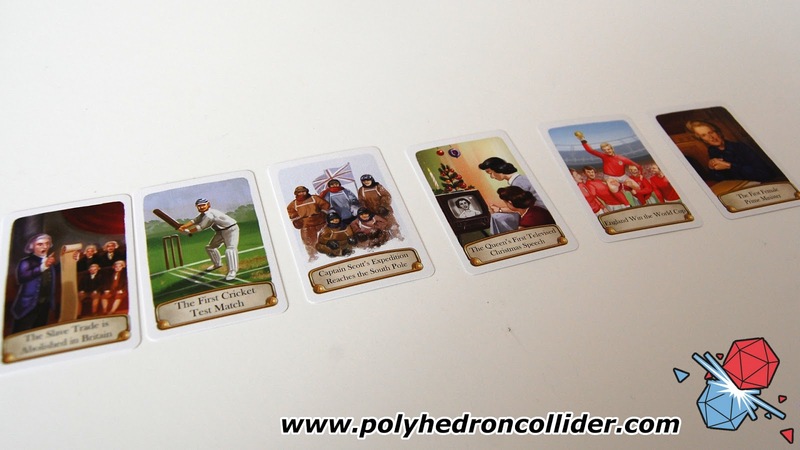 Two or three events in the timeline and it becomes pretty obvious to most people where their card should go, but with 20 events in a timeline you start having to get your card in the right place by as little as a year or two. This simple aspect means that there is some strategy to the game and means that knowing when to play a card can sometimes be as important as knowing when that event happened. Even though Timeline works perfectly fine with two players it’s for this reason that I recommend playing with more people. The game becomes both more interesting and more challenging the greater the number of cards there are in the Timeline and with more players the Timeline grow much faster. This isn't the first Timeline game, in fact there are a menagerie of Timeline games that can be mixed up with all the other version for an increased pool of cards and this is a really good thing. Because Timeline is technically a trivia game if you bring it to the table too often then players are going to start remembering the correct answers. To keep the game fresh I advise mixing and matching Timeline sets. 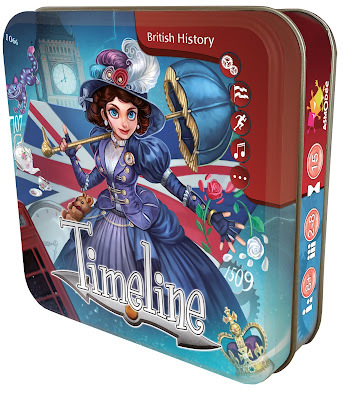 Thankfully Timeline is a relatively cheap game and can be picked up for only £13.99 RRP. As a fully dyed in the wool tea drinking Brit, I am rather pleased the Timeline UK History edition. Technically it means I should know what most of the answers are but as I have already mentioned history is not a strong subject for me, and thankfully not for my usual play group either. It’s also bang up to date, including our historic vote to leave the European union. 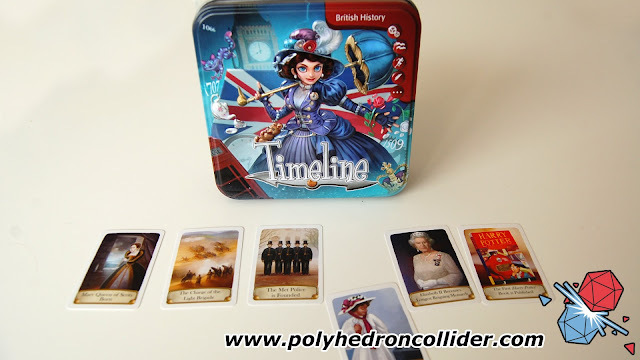 If you’re reading this outside of the British Isles don’t worry, you can still play Timeline UK. Many of the events depicted are such that you can have a damn good stab at the game even if you don’t understand the ongoing argument between Devon and Cornwall over the correct way to eat a cream tea. As you can now doubt tell by the description Timeline is a really simple game to play and, providing you have someone at the table who actually knows anything about history, it's relatively quick. Its simplicity and speed mean that it’s a great game to bring out when none gamers are around, and with Christmas fast approaching you’ll be wanting a game to play with the family and I highly recommend that Timeline is that game.